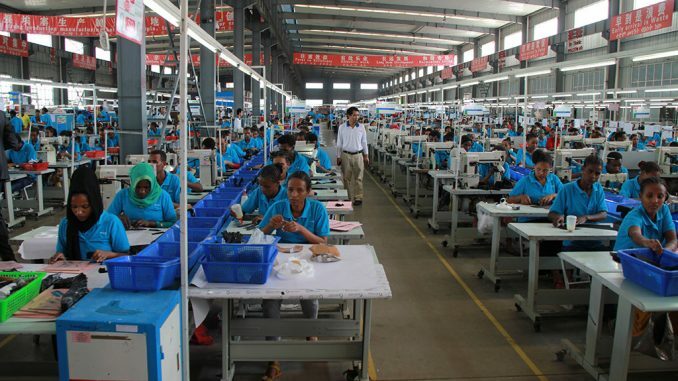 At the Huajian shoe factory in the Eastern Industrial Zone, Ethiopia. Credit: UNIDO. Africa’s industrialisation needs a boost. Implemented correctly, the AfCFTA could provide it. Here’s how. On 21 March, dozens of African countries agreed to establish what could be a truly transformative trade deal. At a special African Union summit convened in Rwanda, 44 governments signed the African Continental Free Trade Area (AfCFTA) agreement. 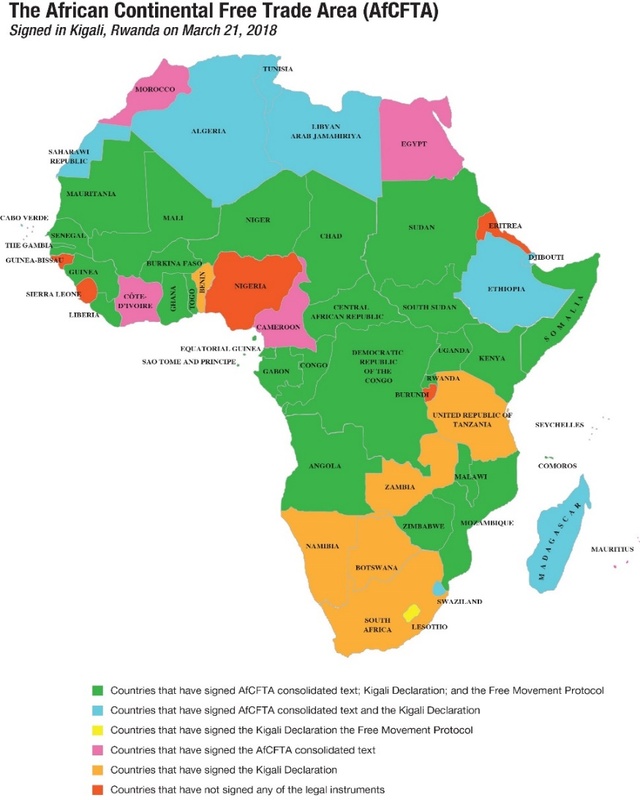 The majority of the remaining 11 AU member states signed the Kigali Declaration, a promissory note to ratify the AfCFTA. 27 additionally signed a separate AU Protocol on the Free Movement of People. Africa’s two biggest economies – Nigeria and South Africa – did not sign the AfCFTA agreement. However, it is expected that they – along with the remaining member states – will do so following national consultations or the fulfilment of constitutional requirements for signing international treaties. The agreement will enter into force once 22 African countries have ratified the deal. Given the current momentum behind the project, this process is expected to be swift and smooth. The AfCFTA commits members to cut tariffs down to zero on imports covering 90% of tariff lines, as well as address a host of other non-tariff barriers. All this is expected boost trade between African countries by an impressive 52.3%. This could have momentous repercussions for a trade area that would potentially contain 55 countries, 1.2 billion people, and a combined $2.5 trillion in GDP. It would enable significant scale economies and attract external investment. More intra-African trade would also have crucial knock-on effects. Given that manufactured goods make up a much higher proportion of regional exports than those leaving the continent – 41.9% compared to 14.8% in 2014 – more intra-African trade means much more opportunity for industrialisation. As noted in a recent report by the UN Economic Commission for Africa (ECA) and the Overseas Development Institute (ODI), Africa is bizarrely less industrialised today than it was three decades ago. In 2014, manufacturing contributed just 9.8% on average to Africa’s GDP, a quarter lower than in 1990. Africa’s exports today still predominantly consist of primary commodities and raw materials, with fuels alone accounting for 53.9% of exports in 2014. At the same time, however, manufacturing in Africa is on the rise in absolute terms. Between 2009 and 2014, for instance, manufacturing production grew at an average 5.1% per year in real terms, with particularly strong performances in Chad, the Democratic Republic of the Congo, Ethiopia, Nigeria, Niger and Sudan. Statistics show that from 2004 to 2014, the value of African manufacturing exports more than doubled. Meanwhile, in 2016, UNCTAD calculated that the manufacturing sector now contributes approximately one-fifth of Africa’s inward FDI stock. Despite a disappointing backdrop, these trends are promising and suggest that with the right impetus, they could be accelerated. The benefits of industrialisation – and the reasons it’s been central to national development strategies across Africa – are clear to see. Manufactured goods are much less vulnerable to fluctuating global prices than extractive goods, meaning they can provide a more sustainable tax base. They are more frequently produced by small and medium-sized enterprises (SMEs), which comprise about 80% of all enterprises in Africa, and are therefore key to poverty reduction. And, perhaps most importantly, manufactured goods tend to be labour intensive, meaning they can better create jobs for Africa’s bulging youth population. Industrialisation is also crucial to transforming the agricultural sector, which accounts for about half of Africa’s workforce. Increasing agricultural productivity through agro-processing would help reduce rural poverty and facilitate the release of more labour. These workers could move onto the more productive activity of manufacturing itself, whose output is six times that of agriculture. It is for these reasons that the AfCFTA has been specifically designed to drive industrialisation. It is crucial this remains a priority as the agreement is implemented. How can this be done? To begin with, the ratification and implementation of the agreement must be expedited. Industries on the continent must have time to find and build their competitive edge before African markets are further opened up to the rest of the world. The AfCFTA’s process of reducing tariffs should also prioritise “intermediate goods” – namely semi-finished products used in the production of final goods. This would boost incentives for businesses to source these inputs from within Africa and support the expansion of manufacturing. The removal of non-tariff barriers and harmonisation of standards across borders could also focus initially on products with industrial potential. Mechanisms to monitor non-tariff barriers, simple rules of origin requirements, and common accreditation practices will be crucial in supporting the expansion of industrial supply chains between African countries. The AfCFTA’s second phase will see negotiations around investment, intellectual property rights and competition policy. This much-needed legal framework – in particular common investment rules – should facilitate cross-border investments that could alleviate constraints to intra-African trade including in infrastructure and technology. This would further help regional industrialisation. Finally, if the AfCFTA is to fulfil its potential in boosting African manufacturing, it must come up with a clear digital strategy. Technological innovations such as automation threaten traditionally labour-intensive routes to industrialisation. The continent must be ready to address these challenges, but also recognise the opportunities these trends present. Expanding the scope of the AfCFTA to include e-commerce, for instance, could provide a platform for connecting African businesses. Meanwhile, it should be recognised that while technology may remove some routes to employment, new jobs are being created in agro-processing as well as trade-related sectors such as branding, marketing, logistics, transportation and distribution. In fact, services now account for over 50% of Africa’s GDP, although there is scope to move from low to higher value services. With discussions over the AfCFTA’s implementation ongoing at the AU, it is promising that the continent’s leaders appreciate that the landmark agreement could play a game-changing role in Africa’s industrialisation. This is not an opportunity to be missed.